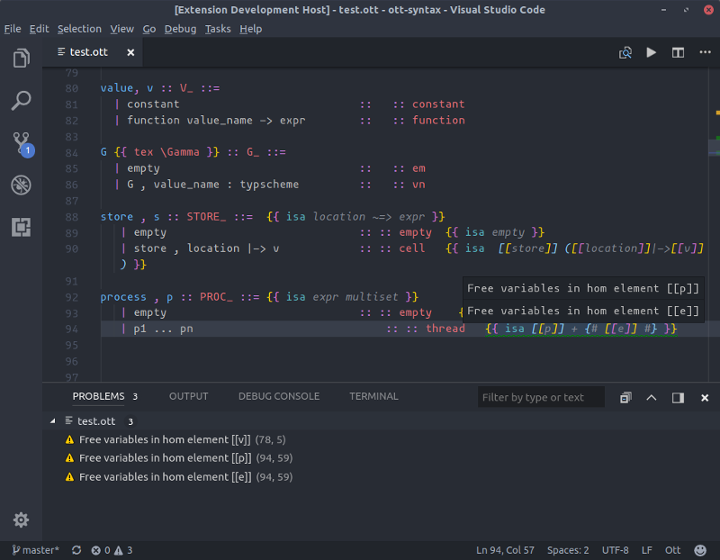 Visual Studio Code>Programming Languages>ottNew to Visual Studio Code? Get it now. Provides syntax highlighting and inline error reporting for the Ott semantics tool. The emphasis is on visually distinguishing the meta-language from the language being modeled. As a result, the files end up quite colorful. I've optimized this for the One Dark Pro theme, but it should look okay with any theme. Some classes might not get distinguished if your theme doesn't define colors for enough scopes, though. I'm no expert when it comes to visual design, so pull-requests are welcome with regards to the color choices. When you save your file, it will be run with ott and any errors will be reported inline. % !Ott args = "ARGS"
Then, Ott will be run with whatever args are given. This is useful for re-generating LaTeX or proof-assistant code automatically when you save. % !Ott postprocess = "COMMAND"
then on saving, after ott has finished, the given command(s) will be run. This is useful for building LaTeX into a PDF file, or for automatically running scripts over generated proof-assistant code. The command ott must be installed and on your $PATH. [ ] Inline unicode replacement, something like prettify-symbols-mode. Contributions are welcome and encouraged! Feel free to leave any issues or submit pull requests. Alternately, if you would like to collaborate, I will happily add collaborators to the repo.